You'll have to move faster than a cute kitty video goes viral if you want a place to stay near Tangalooma. There's only 1 place to stay within 10 kilometres of the centre, so chop chop! There's no need to feel guilty about not setting the alarm if you book a room at Tangalooma Island Resort. It's the most centrally located hotel around, so you'll still be able to fit in a good day's worth of adventures! After more options? The On the Beach Resort Bribie Island is located 20 kilometres away from the main central district, and the On the Bay Apartments is 25 kilometres away. Others are the Oaks Mon Komo, 25 kilometres away, and the Redcliffe Motor Inn, 30 kilometres away. Always on the lookout for your next awesome adventure? You'll be happy to know that the wider Queensland region has some brilliant things to throw yourself into as well. Sharpen your landscape photography game by visiting some of Queensland's amazing beaches, rainforest and tablelands. Craft workshops and farms are a few more places worth pulling your camera out for. Alternatively, have a go at some popular regional activities like hiking and horse riding. Want more options? Live it up like a rockstar in Wynnum West (just try not to wreck the joint). 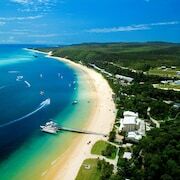 Sitting 40 kilometres away and home to Bricks n Fun and Manly Boat Harbour, it's bound to be an adventure to remember! 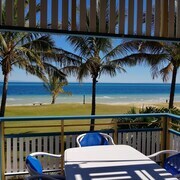 If you'd like to spend a night or two in Wynnum West, look into The Waterloo Bay Hotel and Manly Harbour Backpackers. 40 kilometres to the west of Tangalooma you'll find Caboolture, which is home to the Best Western Caboolture Central Motor Inn and Sundowner Hotel Motel. The Abbey Museum of Art and Archaeology and the Caboolture Warplane Museum are up there with the most popular places to explore when you're in Caboolture. Totally flipping out cos you haven't got anywhere to lay your hat when you hit the tarmac? Don't worry, last minute is our speciality! You'll find the Novotel Brisbane Airport a convenient taxi ride from Brisbane Airport, which is 35 kilometres from the middle of Tangalooma.